Wisteria are one of the most free-flowering and coveted of all climbers. And because they are normally purchased as grafted stock they are also one of the most expensive. With that in mind you will want to get the most out of yours and if you get the pruning right your wisteria really will flower its heart out. 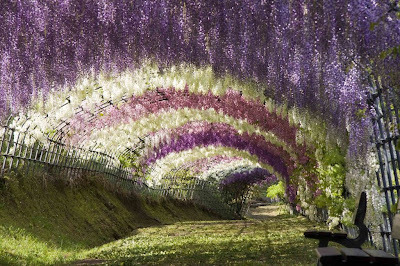 Wisteria will grow freely in almost any soil. The ideal is a moist, rich, medium loam, but where this is not available, prepare a planting site that will give plenty of room for root growth. The flower buds are susceptible to damage from late frosts or cold winds. With that in mind, they will need the protection of a south or west facing wall - particularly in positions where where early morning sun follows the frost. Plant out young pot grown plants from October to March in temperate weather. Provide a permanent support, and tie the young growths to it until the twining stems can gain a firm hold. Excessive fertilizer, in particularly nitrogen can cause your blooms to fail. Wisteria has nitrogen producing bacteria in root nodules, and while mature plants may benefit from added potassium and phosphate, they will perform poorly with to much nitrogen. 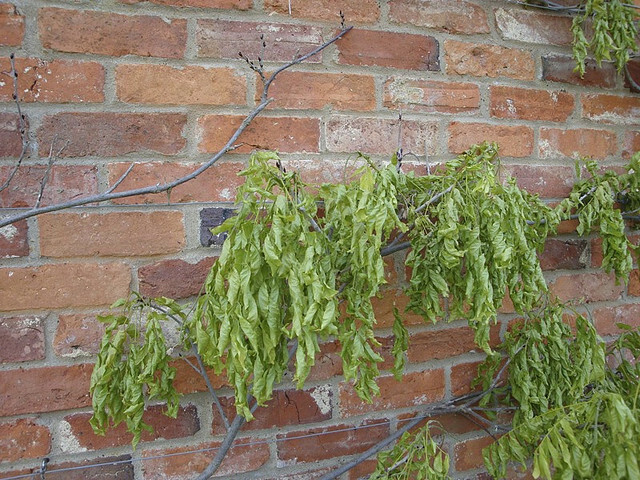 Be aware that if your wisteria is seed grown and not from grafted stock it can be reluctant to bloom if it has not reached maturity. Maturation may require only a few years, as in Kentucky Wisteria, or nearly twenty, as in Chinese Wisteria. Maturation can be forced by physically damaging the main trunk - but not too much, root pruning, or drought stress. Wisteria can grow into a mound when unsupported, but is at its best when allowed to climb up a tree, pergola, wall, or other supporting structure. Whatever the case, the support must be sturdy, because mature Wisteria can become heavy with wrist-thick trunks and stems. These will certainly break apart latticework, damage thin wooden posts, and can even strangle large trees. Furthermore, be careful when allowing wisteria to grow on the sides of houses. They can cause damage to gutters, down pipes, and similar structures.